Explore the National Parks for free on Veteran’s Day. Get on your hiking boots because Utah’s national parks are calling once again. Thanks to the National Parks Service, you can enjoy free admittance on Veterans Day, Friday November 11, 2016. Check out these lesser-known fun adventures in three of Utah’s national parks. November is a beautiful time of year for horseback riding. Ruby’s Inn, Bryce Canyon’s nearest hotel, provides horseback riding tours every season. Clomping on horseback provides the perfect opportunity to explore beautiful Red Canyon. The Thunder Mountain Trail climbs in and around red rock hoodoo overlooks while traversing through green ponderosa pines. If you’re lucky enough to go when it snows, horses are versatile enough to make it through most weather conditions and you’ll catch the amazing red rock scenery against the white crystalized snow. Enjoy the fresh wind in your hair while mountain biking on Bryce Canyon trails. Rentals and a shuttle service are available from Ruby’s Inn. 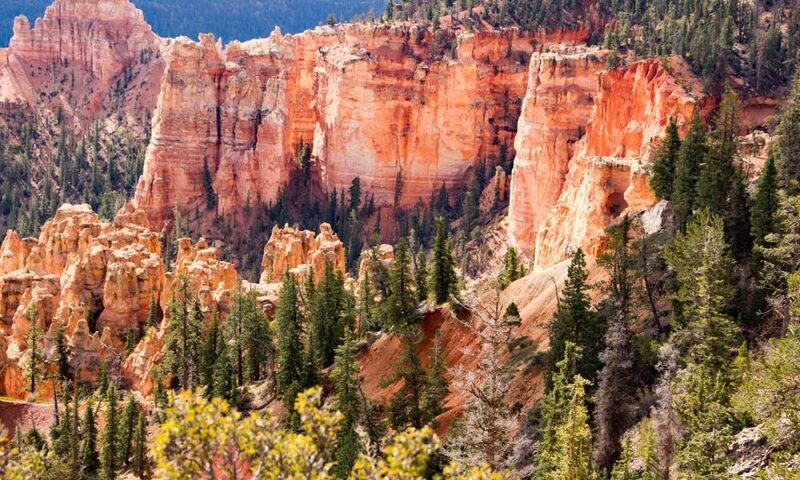 Zoom through ponderosa pines and alpine landscapes to catch amazing views of the highest concentration of hoodoo rock formations in the world at Bryce Canyon. November’s setting sun makes the oranges, reds, yellows, blues and greens stand out brilliantly. The Waterpocket Fold is a great sight to check out in November’s crisp air. The name comes from how the rock has been pushed and molded into many enormous mountain-like folds. This buckle in the earth runs north and south for 100 miles. The brilliant colors of white, red, orange and even stripes of blue paint the landscape. The wind and water have carved into the rock creating many narrow slot canyons which make for great sights and hiking opportunities. Escape the crowds this Veteran’s Day by experiencing Canyonlands’ unique Island in the Sky scenic drive. This 34-mile sightseeing drive has great 1,000 foot overlooks above the incredible terrain. If you want to stretch your legs, there are plenty of hiking trails that take you back country for a few hours or more. November is a great time to experience the Grand Canyon-like views because the November fog make you feel like you’re really on an island in the sky.